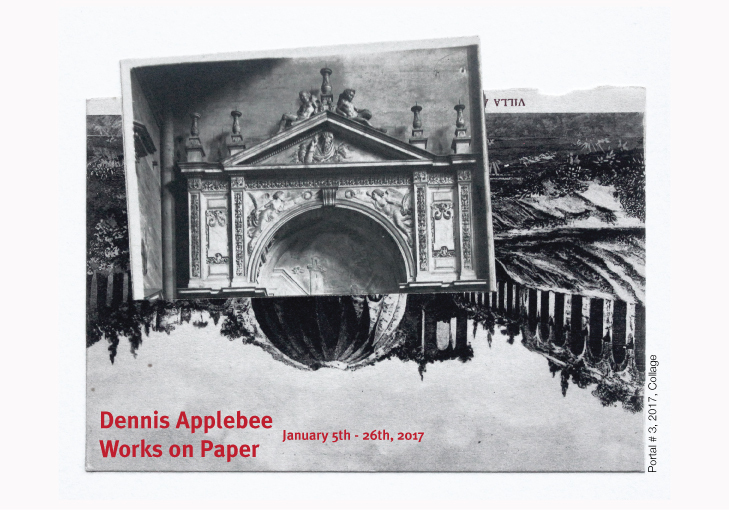 Join Macon Arts Alliance for Dennis Applebee’s opening reception of Works on Paper in First Friday. The collages will be on exhibit in the gallery January 5-26. One encounters systems and structures in almost everything they do. From the natural order of the universe (illustrated by such patterns of organization as the periodic table of elements and the mathematically proportioned progression of the nautilus shell), to the human order of the world (artificially imposed systems by which one is able to understand the relationship of the elements found in the periodic table or the golden mean, or allows one to replicate the proportions created by the nautilus shell). My work explores the relationships between music, language and mathematics. I am interested in how we seamlessly move between these varied systems with little effort. There seems to be some underlying pattern that ties these (and possibly all systems) together. I work within self-made constraints. I collage old bookend pages to create platonic solids. I mark letters within a text that look like musical notes (o, p, d, q), to reveal hidden rhythms in language. I take sheet music and collage it in ways that use harmonic relations and reference art history, such as Soviet Constructivism or Greek decorative art. I take images out of context and integrate geometric shapes or patterns that reference architectural and mathematical schematics and maps. By building bridges between music, language, and math, I attempt to create something new while providing an air of familiarity, in an attempt to reveal their connecting patterns.